My parents have always been extremely dedicated and supportive of my brother Geoff and I. 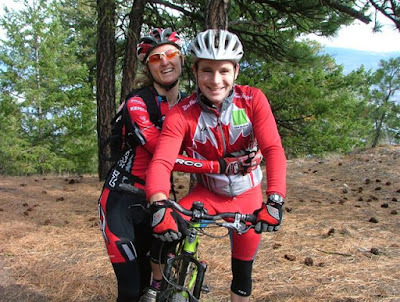 When I decided to move to BC and headed west with my mountain bike it was my mom who hauled my road bike across the country to visit me. Mom started her plane trek from New Brunswick on Sept 11th. Yes 2001. Her plane was forced to land in Winnipeg due to the tragic events in the US. Now in Winnipeg with a bike box my mom spent several dayscarting it back and forth to the airport trying to catch a flight before finally settling on the train. It had been raining and the cardboard bike box was now soggy and crumbling. Mum arrived in Victoria tired and vowing to never travel with a bike box again. I don’t think I ever adequately thanked her enough for that. Thanks Mom! Dad was my first sponsor. As Geoff and I got more ambitious about racing it was Dad that drafted a sponsorship proposal for each of us expressing his belief in our abilities and his desire to help us a long the way. Dad also signed up and became a commissaire for the NB race circuit and tirelessly drove us to races as Geoff and I inevitably fell asleep in the passenger seats. Thanks Dad! Keith. My secret weapon. He pretty much does it all. 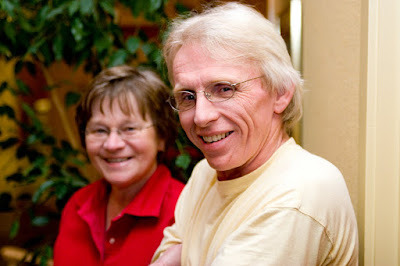 Keith has been my training partner, my technical coach and my major support system. He is always grounded and confident in me, pushing me to strive higher. It was Keith that encouraged me to stick out the low paying jobs which allowed me the flexibility to train and race by telling me anyone could go back to school and get a “real job, how many women can say they could be one of the best mountain bikers in the world?” Thanks Keith! Dan. 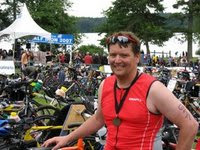 I met Dan when he was coaching the Uvic Triathalon club. I keenly showed up to all the practices hoping to figure out just how these interval things would make me faster. We’ve worked together for the last 4 years. Through balanced elitewave.com programs and keeping training fun and interesting I have seen huge improvements every year and am looking forward to another year of training under his guidance. Thanks Dan! Dan at the 1/2 Ironman. Dan has done 10 full Ironmans!!!! Norco. Neil Mckinnon the Eastern events manager in 2004 took me and my Norco (care of the Bike Barn in Penticton) under his wing. He kept promoting me to the team guys and I guess it worked. That fall I signed with Norco and we have grown together. Norco has been fantastic, increasing their support over the years and including Keith as an important part of my team. The bikes are awesome and the crew is great. Special thanks to this year’s crew Pete, Jamie & Havy as well as Fee and jill who were super fans! Sues and Grainger. Raised a wonderful son and always have room for us when Keith and I show up on their doorstep with multiple bicycles and often a cat or two in tow. They have taken in our cats for weeks at a time so we can travel together and they keep Keith well fed and loved when he gets left behind as I go off ot race for a month. Thanks!